Sir Lawrence Freedman is Professor of War Studies at King’s College and the author of numerous books and publications to include Strategy: A History. In Episode 7 of the PME podcast, we talk about strategy. What is strategy and what it is not? We trace its historical roots, and discuss how traditional views of strategy still apply or do not apply to today’s conflicts and future conflicts. Additionally, Sir Lawrence Freedman was elected a Fellow of the British Academy in 1995 and awarded the CBE (Commander of the British Empire) in 1996. He was appointed Official Historian of the Falklands Campaign in 1997. He was awarded the KCMG (Knight Commander of St Michael and St George) in 2003. 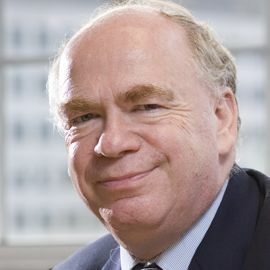 Finally, he was appointed in June 2009 to serve as a member of the official inquiry into Britain and the 2003 Iraq War. • What is strategy? Strategy involves making decisions when faced with “other people with their own plans and interests.” It requires flexibility. Planning is part of strategy, but having a plan is not a strategy. “Problem solving” is a critical component of strategy. • Sir Lawrence Freedman explains that American foreign policy doctrine (i.e. the Nixon Doctrine, Carter Doctrine, Bush Doctrine, Obama Doctrine) is a means of “signaling” to the world America’s priorities or intentions. It is part of strategy, but it is not itself a strategy. • Sun Tzu’s influence on strategy was based on the idea of “cunning and cleverness.” However, the flaw in strategy based on cunning is when both sides attempt to use cunning and cleverness against each other. We talk about whether countries like Russia and China use Sun Tzu’s methods to achieve their strategic aims. What are Russia’s interests? A conversation I had with Steven Lee Myers on his book The New Tsar is worth checking out to discover more on that topic. • Thucydides was the first “realist” historian. He wrote a book about the Peloponnesian War between Sparta and Athens in a book appropriately called The History of the Peloponnesian War. Sir Lawrence Freedman sites a book called Destined for War by Graham Allison. Destined for War describes a theory called the “Thucydides Trap” which is based on the idea that one power becomes fearful of the rise of another power and postulates that this might have ramifications for current and future relations between the United States and China. However, Sir Lawrence Freedman sees some flaws in this theory, and thinks that Thucydides had an interest in trying to preserve the reputation of Pericles. • We discuss whether there is something “elemental” to strategy. Sir Lawrence Freedman looked at chimpanzees and how they form coalitions and act in strategic ways. Winston Churchill (not a chimpanzee rather British Prime Minister) was good at applying the chimp-like principles of creating coalitions to achieve his strategic aims. Churchill sought to partner with President Roosevelt to get the U.S. on the allied side. When Hitler invaded the Soviet Union, Churchill sought to build a coalition with Joseph Stalin and the Soviet Union to fight the Nazis. • We talk about Napoleon and the development of strategy during the Enlightenment. Much like Thucydides rejection of the gods, the enlightenment rejected superstitious beliefs and emphasized what reason and human rationality could do to achieve strategic aims. • Two critical 19th Century strategic thinkers include the Swiss officer, Antoine Henri Jomini, and the Prussian military theorist, Carl Von Clausewitz. Jomini emphasized the “decisive battle” strategy. Meanwhile, Clausewitz focused on the policy objectives of war. Clausewitz is also famous for developing the term “fog of war,” which refers to the uncertainty and the chaos of war when it involves two competing wills, each one trying to impose itself on the other. • The challenges of military strategy. How do wars end? We talk about “The Clausewitzian Challenge”, and I allude to my previous conversation with Gideon Rose, editor of Foreign Affairs, who wrote an excellent book called How Wars End. • Finally, we talk about the strategy of the Cold War and nuclear deterrence. Sir Lawrence Freedman mentions a strategist named Thomas Schelling, who is worth studying for his contributions to strategy based on Game Theory. We discuss the “rationality of irrationality,” which refers to the necessity to use caution based on a fear that one side might act out of irrationality. • Sir Lawrence Freedman has a new book coming out in the Fall of 2017 called, The Future of War: A History. The book focuses on how people in the past have tried to predict changes in warfare and predict the future of war.